The Environment Enhancement Project (EEP) is a mechanism to provide region and parcel holders and individual Second Life users, greater control over there personal environment or the environment for their region / estate or parcel. This tutorial is designed to walk you through the essentials of EEP, including the terminology used. The introduction, covering EEP capabilities, concepts and settings permissions; viewer menu options; the region / estate and parcel controls; and how to create / edit EEP asset types. Using the Personal Lighting floater to adjust the environment in your view. Using the Fixed Environment controls and options to control individual Sky and / or Water settings. Using the Day Cycle controls and options to create complete day / night cycles, including different settings defined by altitude. This section, Importing Windlight Settings and EEP LSL Resources. If you are coming fresh to EEP, it is recommended to read the introduction first. Note that this tutorial has been written using the official EEP project and RC viewers. TPV implementations of EEP (when available) may vary. You can import any windlight XML files as EEP assets using the import function. Note: You should import Windlights of the same type as the editor you have open (day cycle, sky, or water). Windlight XML files are very sensitive to the directory structure. Files should be laid out as follows: ./windlight/days, ./windlight/skies, ./windlight/water. Create or edit an EEP asset matching the type of windlight you wish to import (e.g. create or open a Sky EEP asset to import a windlight fixed sky setting). Click the Import button in the top right corner of the Edit floater. A file picker window will open. 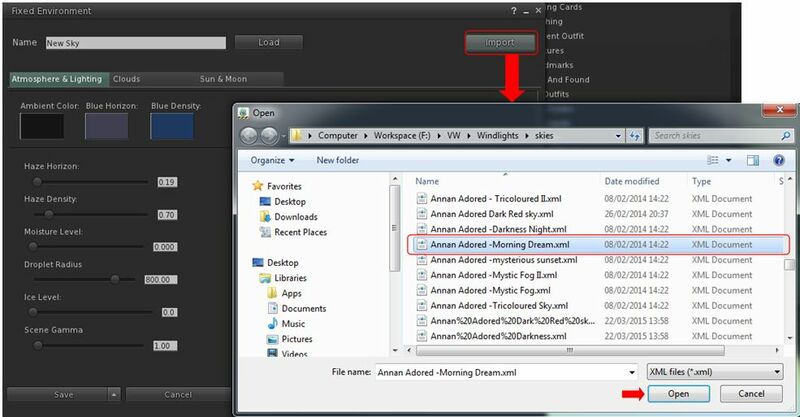 Use this to navigate to the required folder of windlight settings you have saved on your computer. Click on the windlight you wish to import to highlight it, then click Open. The windlight is imported into the EEP Edit floater. You can now edit the imported windlight, if required and then use Save As from the drop-down as the bottom of the edit floater to save it as a new (and modified) asset in your Inventory. Or you can use Save As to save it as an EEP asset “as is”. Use the Import button to import more windlights, if required. Note: during the import process, the system will attempt to convert the selected windlight into an EEP asset that as closely as possible reflects the original settings (gamma, haze, sky tints, cloud tints, etc.). However, converting some windlight files may not results in a perfect like-for-like conversion, with the EEP asset created in the import process being potentially dark or lighter than the original windlight or varying in things like horizon haze, etc. Note: llReplaceAgentEnvironment and llSetAgentEnvironment must be used in an experience. The others are unrestricted in their use. If you are a photographer, and only wish to know how to make quick, windlight-like changes to a location’s environment, go to Personal Lighting. If you wish to know more about creating and editing EEP Sky and Water assets, go to Fixed Environments. If you wish to know more about creating and editing EEP Day Cycles, go to Day Cycles. However, it is recommended you read about Fixed Environments first, if you have not already done so. Back to the tutorial introduction.